Welcome to the inaugural posting of 5 Comics You Should Be Reading! In this space we’ll be highlighting books that perhaps we didn’t have time for in our usual reviews (hey, we’re only human) or that we loved so much we’re mentioning them again dammit! This will also give us a chance to step back and consider overall series, as opposed to individual issues. As it’s approaching All Hallows Eve, when the membrane separating the living and the dead is at its most tremulous, I thought it a good time to throw a quavering lantern light on the field of horror and the supernatural. A couple of personal, debatable rules when it comes to horror: No Superheroes. Just the presence of a costumed do-gooder robs a proper spine-tingler of one of its most potent premises; that things may not turn out alright. Superheroes are a safety net in the free fall of terror (Yes, even Batman). Second, no stories that use Halloween as a direct reference point. These stories are limited to an annual, holiday-themed reading. Horror books, on the other hand should be enjoyed all year round. (Sorry, good as it is, you will not be finding The Long Halloween on this list). 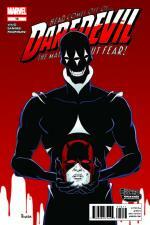 A couple of shout-outs: Dark Horse is the leading publisher of horror comics by a wide margin. Though none of their books appear on this list, their catalog is replete with enough (burnt) offerings to satisfy the bloodlust of even the most ravenous bloodsucker. The Walking Dead is also not on the list, since, let’s face it, you’re probably already reading it. With issue #2 finally due out in a couple of weeks, now’s a good time to check it out. 4. Dark Shadows (Dynamite) – Not the tongue-in-cheek Tim Burton parody. This iteration harkens back to the original cult classic, staying true to the melodramatic pitch and outsize personalities of its characters. But because this is a comic book and not a TV show, the camp of cheesy special effects and awkward editing is toned down in favor a style that has more in common with the lush, outre Hammer films of the 1950’s-70’s. The current creative team of Mike Raicht and Guiu Vilanova have things bubbling nicely. And you can’t miss it thanks to Francesco Francavilla’s Eisner Award-winning covers. Purple dialogue, picturesque settings rocked by intermittent spasms of Grand Guignol violence; forget gothic, this series is positively baroque. 3. Courtney Crumrin (Oni) – Ted Naifeh’s coming of age tale of a young witch is what every ongoing supernatural series aspires to be: multilayered, textural, and driven by distinct, compelling characters caught in a fully realized world fraught with secrets, threats and humor, all of the macabre variety. 2. 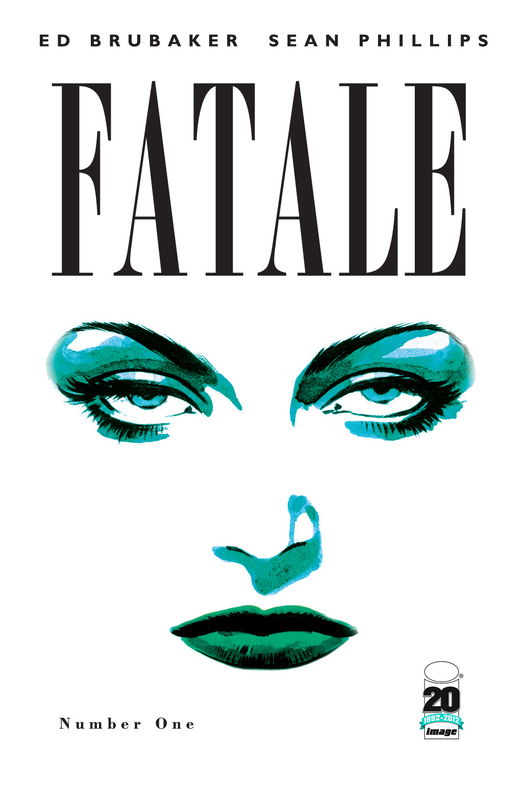 Fatale (Image) – Ed Brubaker and Sean Phillips apply their considerable noir chops to the bottomless well of Lovecraftian horror with chilling results. A postmodern mash-up of classic genres with the potency of aged whiskey drunk from a medieval goblet. 1. Severed (Image) – The story follows Jack, a Depression-era urchin, as he travels across 1920’s America in search of his wayward musician father. His quest is derailed by an evil as ordinary and ingratiating as it is terrifying. In the Salesman, writers Scott Snyder and Scott Tuft have created a monster that instantly takes his place amongst the greatest bogeyman of our times. Just as the Salesman toys with Jack, Snyder and Scott take their time, letting the suspense of the story simmer, notching up the heat with exquisite, inexorable deliberation over seven issues, until it finally, unforgettably boils over. The art by Attila Futaki is a Norman Rockwell nightmare. Simply put, this is the best horror comic in recent memory; a sophisticated, unsettling tale that will sit in your gut like a cold, dead lump, long after you’ve put it down. Derek Mainhart: Sounds like you ended up enjoying it more than you initially thought! After the dark terrain of the last couple of issues, I definitely felt this was a return to form. The culprit behind DD’s recent woes was revealed, and if the answer was a bit underwhelming (a throwaway villain from the first issue), Waid’s creative exploration of his Tex Avery superpower was alternately farcical and chilling. I’d also like to commend Waid’s command of pacing here. He’s one of a very few writers (Grant Morrison comes to mind) who understands how the physical structure of a comic book can enhance the experience of reading it. The cell phone scene you mention is a perfect example. The danger is set up perfectly on page 2. Then you have to turn the page for the unexpected, laugh-out-loud punchline. 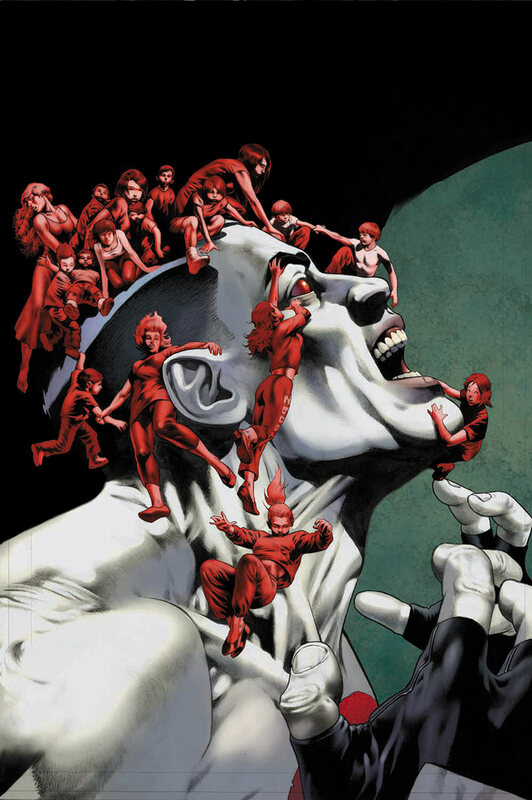 Since we’re discussing arcane comic book points, a similar thing happens in Batwoman #13. The plot is negligible; Wonder Woman and Batwoman have teamed up to find Medusa for some reason. Whatever; in this book the story exists for J.H. Williams III to hang his art on. I feel like every time we review Batwoman, I just go on about how gorgeous the art is. Well this review is no exception. The visuals are unbelievable (colorist extraordinaire Dave Stewart deserves mentioning here as well). The beat I’m referring to begins on pages 11-12, as Wonder Woman, unseen, is bound and trapped in pitch blackness (also featured is some bravura lettering by Todd Klein – everyone gets their due in this review!). The layout of this two-page spread is absolutely claustrophobic. I’ve never experienced anything quite like it. And then the page turn and the abrupt transition from suffocating dark to blinding light – I swear you’ll need sunglasses. Another favorite: the two-page spread on pages 4-5 (only Williams can justify a book full of ’em!) as our heroines traverse an underground labyrinth. The bird’s eye view, revealing the complexity of the thing, is a stunner. I literally tried to fold it like an Al Jaffee fold-in from Mad Magazine, sure there was some hidden image (even after several unsuccessful attempts, I still kinda think there’s one). Buy it and gawk. (The spasmodic contrast between the dark and light realms is exactly what was missing from the first issue of Happy!) As the title itself suggests Ewing deals in wordplay, which runs the gamut from groaning puns to sublime silliness (my personal favorite – his take on “fancy pants” – I want a pair!) He even manages to break the fourth wall in a way that is relatively understated and actually makes sense within the framework of the story, which shines a fun-house mirror on our TMZ / OCD culture. Now all of this does run the risk of becoming wearying in the long run. But this first issue, with its wild invention, expansive scope and off-kilter storytelling takes its place alongside Brian K. Vaughan’s Saga, China Mieville’s Dial H and (yes, I’ll say it) Ryan North’s Adventure Time, as invigorating examples of craft and imagination. Truly a breath of fresh air in the comic book world. Book of the Week. Book of the Week. Book of the Week. SC: But how did you really feel about it? Now, let’s see, what else moved me? Well, if you’ve read my Scottlight on: Swamp Thing #0 post, you know how much I love a good head chompin’. And there, in Wonder Woman #13, two pages in, there it is, in the final panel: a little noggin noshin’. For one reason or another, that’s where my joy–and my enjoyment of the book–was chewed up and swallowed away. 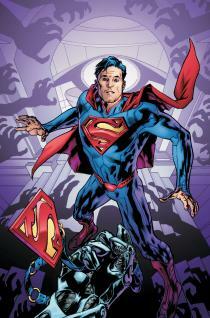 I’m not sure it’s tied to anything Brian Azzarello has done; he’s certainly pushing his story along well enough. I think I felt let down by Tony Akins’ inconsistent artwork. I mean, did you notice the last panel on page 21? Gotta wonder about that woman. Neither Harbinger #5 nor X-O Manowar #6 did it for me this go-round. Ink and color me a bit nervous about the Valiant books, especially with the new titles on the horizon. In Ultimate Spider-Man #16, Brian Michael Bendis makes a clear-cut case for a costume-free Miles Morales–for an Ultimate Miles Morales on-going, which would undoubtedly be superior to anything Marvel’s putting out NOW! DM: Regarding this issue’s focus on blah super hero shenanigans, I must point to my review of the previous issue of USM – I told you so! Now if you’ll excuse me, I think I pulled something whilst patting myself on the back. Where’s that ointment?…. Back and Forth: DC Won! 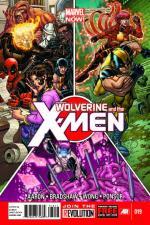 Derek Mainhart: Well here we are closing in on Halloween, but for comics, the summer-style blockbusters from the Big Two keep on comin’. I guess I should start with the one I actually read. Batman #13 – The Joker? Issue 13? Perfect set up for some Halloween frights. 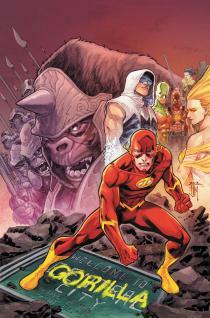 If only it were just that; but this much-hyped return of Batman’s nemesis is also the next epic crossover. Having just come off the whole Court of the Owls storyline (which was largely excellent) I must admit to feeling a little epic-fatigue. I do wish this was contained solely within Scott Snyder’s Batman instead of spread out across the whole Bat-family (not that I intend to buy all the other issues). Having said that, Snyder gets things off to a solid start. We get all the classic Joker beats in one issue: Joker assaults a police station? Check. Joker stages an elaborate, announced plan to kill a public official? Check. Joker lures Batman into an over-the-top deathtrap? Check. Having cleansed his palette, we can assume Snyder will be off and running with some new wrinkles next issue right? He certainly hints at it. He seems to be setting up a bigger, badder Joker. Harley Quinn spells it out: “He’s not the same Bats. He’s not my Mr. J. anymore…” I suppose this is tied into the whole getting-his-face ripped-off thing from Detective #1. (This begs the question: whose idea was that? Tony Daniel’s? The editors’? Or was Snyder setting this current story up a year ago?) But really, how much more twisted can the Joker get? Is Snyder suggesting that this version is somehow more monstrous than the Joker of Alan Moore’s character-defining turn in The Killing Joke? Trying to make this character more extreme seems to be just a way to fulfill the parameters of an “epic event”. Why not just give us an awesome Joker story? But, like I said, there’s much to like. The story-telling by Greg Capullo and Jonathan Glapion is excellent. Most of all, Snyder really excels at developing an underlying sense of dread through the entire book (his mastery at this was established in Severed (published by Image) which was practically an exercise in keeping your skin crawling over seven issues. The best horror book of recent memory. Get the trade for Halloween.) Speaking of which, how about that back-up? I only wish we could have read that before the events in the lead story! 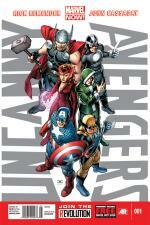 I’ll let you handle the honors on this week’s other blockbuster: Uncanny Avengers #1. Scott Carney: Oh, joy. Your generosity knows no limits! Must be your mutant ability. For the record: I’m looking at Batman #13 as I would the first ten or so pages of The Great Gatsby–which means, in my mind’s monotone: “Now that that’s done with, let’s get on with the good stuff.” Like you said: the back-up was pretty sweet–like cyanide. Damn thing should’ve been part of the story proper. OK. I’ve put the “honors” you so benevolently bequeathed to me off long enough. First panel: an eye held open a la the brainwashing scene of Kubrick’s A Clockwork Orange; glowing in the iris is Cyclops as the Phoenix. Speech bubble: an unknown spouting anti-mutant babble. Second panel: zooming out, we see two eyes held open a la the aforementioned a la, a trickle of blood between them, and some more babble, rousing some rabble about “evolution” and “competition”–which, interestingly enough, put me in a certain mind. Fifth panel: the voice–now clearly Remender, in my mind, anyway–hops into a heap of “hatred[, which] protects a [comic company, like Marvel] from complacency in the face of [its more successful] rivals[, clearly DC].” As he does, he shoves some device into the empty space in the eye guy’s head. And that device, my friend, is Marvel NOW! What a way to begin this glorious new initiative: with Remender’s mocking Marvel readers by making them out to be an easily-led legion of lobotomized zombies–zombies willing to buy into the reactionary ReEVOLUTION, which, apparently, isn’t much of a revolution at all. In fact, according to Axel Alonso, Marvel’s editor-in-chief: “The only change is some subtle tweaks to some costumes.” Indeed! Phew. I’m exhausted after that. I’ll leave the rest to you! DM: Yeah, dude. Take a deep breath–or a nap or something. 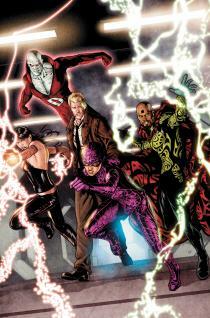 I’ll jump into another book tying in to a crossover event is Frankenstein: Agent of Shade #13. This book also pairs well with our October fright-fest, as our favorite, tragic zipper-neck gets knee-deep in the Rot from the current Animal Man/Swamp Thing epic. Tie-ins like this are usually superfluous and best-avoided. And truly, nothing integral to the Rotworld story seems to happen in this issue. But not picking it up would mean depriving yourself of the stirrings of undead/amphibian love! Frankie riding a talking horse through post-apocalyptic Metropolis! And Matt Kindt’s freewheeling revisiting of Mary Shelley’s Modern Prometheus with Daddy issues! In terms of the larger story, this issue is indeed tangential and probably unnecessary. It is also one more thing: wildly entertaining. Archer and Armstrong #3 may not be part of any crossover event, but with its globetrotting antics and millennia-spanning conspiracies, it sure feels like a blockbuster (and a pretty one too, as drawn by Clayton Henry and Pere Perez). But no mindless action spectacle this. The swordplay and martial arts are merely dressing for the big ideas that Fred Van Lente is playing with here (no surprise from a scribe who co-created a comic called Action Philosophers). Van Lente is an interesting, idiosyncratic writer; conversant in popcorn archetypes, he exploits them to plumb deeper thematic territory. If he has a weakness, it’s that his character’s reactions sometimes seem unearned. Archer’s about-face rejection of his lifelong indoctrination doesn’t ring true. And Armstrong’s response to the killing of a character he calls “the best woman I’ve known for ten thousand years” is simply “Bastards.” Still, this is fascinating stuff. The rollicking action and effortless odd-couple, cop-buddy banter make a breezy read out of what is, after all, a thoroughly-researched satire about nothing less than the nature of faith. SC: You know, that’s exactly what I was gonna say! A smaller haul than I had hoped, but hey: I’ve got me some good readin’ within reach. Just need a minute of your time–and a million others like you–because I ain’t go enough of my own. Maybe someday I’ll have time to read ’em! I opened my bag and bing, bang, boom, suddenly I found myself in the ’90s.